I thought it was a mercy killing when it was announced that yet another sequel to the Turok franchise had received the axe. Little did I realize what might have been, the hope and promise of a generation dashed once again by the swipe of some money-grubbing fool's pen. Now that I learned that dinosaurs might have been playable in this now cancelled game, I feel an emptiness in my soul that may never be soothed. The folks at Voodoo Extreme discovered some interesting tidbits about the title, culled from the portfolio of Propaghanda Games former Lead UI Artist, Garrett Knight. Most notably is an interface video showing an option to configure controls for Turok and "Dinosaur." Knight has since taken his entire portfolio off the web, citing "unforseen circumstances." You would think that info leaks of this nature would no longer qualify as "unforseen" by this point. I'm really bummed about this because the last time I had the opportunity to play as a dinosaur in a game which even remotely appealed to me was on the Sega Genesis, with the "Rampage Edition" of Jurassic Park. Velociraptors were all the rage back then, but I wonder now. 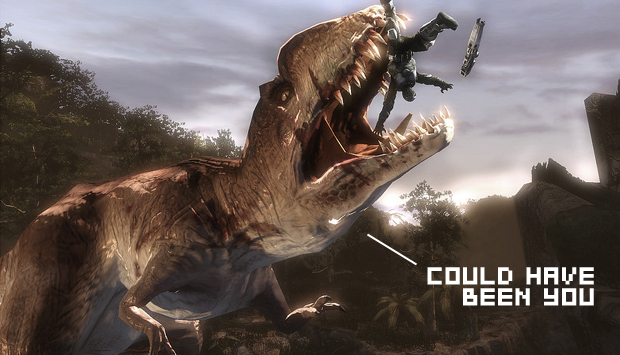 What type of dino would you have wanted to eat Turok as?